There’s not much my husband likes better than tiramisu. I don’t know what it is… the silky mascarpone, the decadent coffee and rum (or wine), or the chocolate. Or maybe it’s how they all sing together in perfect dessert harmony. One thing’s for sure, tiramisu is his favorite dessert, bar none. Even given a choice between carrot cake (his favorite cake!) and tiramisu, he’ll choose tiramisu every time. It’s definitely up there on my scale too, and I think that scale just got tipped with these Tiramisu Brownies. 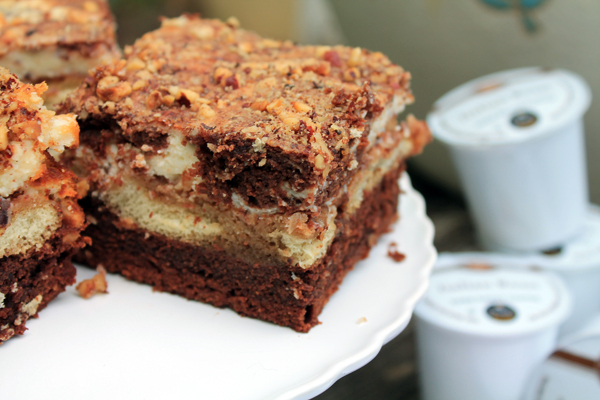 This month, as part of the Keurig K-Cup Ambassador program, we were sent samples of Barista Prima Italian Roast coffee, plus a recipe for these luscious brownies, and most of the ingredients to make them. For even more fun, different “mix-ins” were provided: raspberry jam, mint extract, and fresh chopped hazelnuts. Maybe I’m a bit of a traditionalist, but I didn’t think I’d care too much for mint or raspberry in my tiramisu, so I added in a whole tub of crunchy chopped hazelnuts. I think they add the perfect crunch to go along with cakey brownie, lady finger, and creamy mascarpone layers. Barista Prima Coffehouse blends are great if you have an espresso lover in the house. They brew up dark and dangerous, and are the magical match to tiramisu, brownies or otherwise. 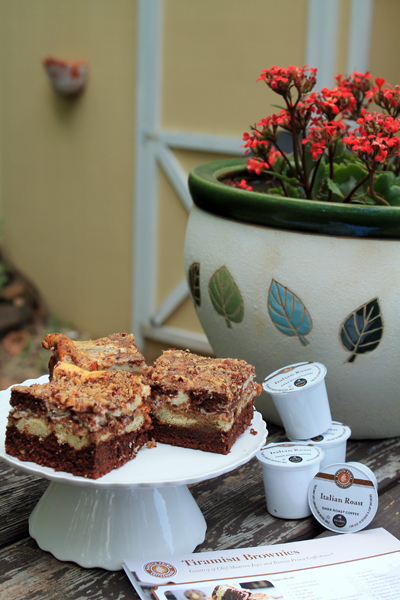 We’d love it if you’d try these brownies, and Barista Prima blends. We’ve even got a coupon to get you started! Using a microwave safe bowl, melt chocolate chips in 30 second intervals. Stir vigorously after each interval and then microwave again until all chocolate is melted and you have a smooth consistency. This took me about 2 minutes. Allow the chocolate to cool. Add the chocolate to a large mixing bowl or bowl of a stand mixer, then add softened butter. Beat the butter and chocolate together on medium speed until well combined and smooth. Add 1 cup of sugar, 4 eggs, and 4 egg whites and beat again until the batter is well combined and smooth. 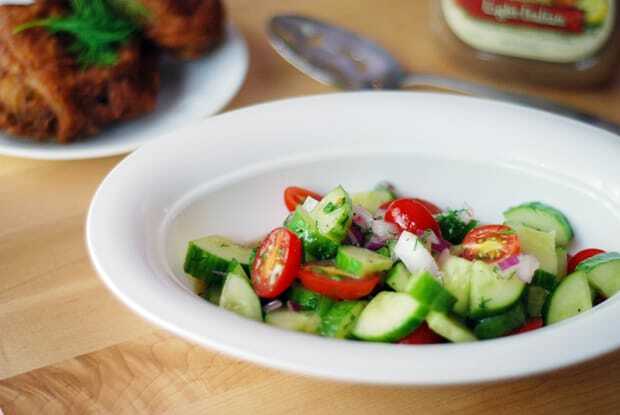 Scrape the sides of the bowl often. Add one cup of cake flour to the batter and mix on low speed or by hand until just combined. Preheat the oven to 350°F and heavily spray a 9×13 cake pan with cooking spray. Reserve one cup of brownie batter, then pour the rest into the cake pan and spread evenly across the pan. Press lady fingers into the batter just slightly. I used 10 lengthwise (5 at each end of the pan), and roughly 6 widthwise in the middle of the pan. 3 of the widthwise lady fingers had to have the tips broken off so they would fit evenly. Mix the brewed and cooled coffee with dark rum or Marsala wine. Use a pastry brush to saturate each lady finger with the coffee mixture. Sprinkle 1/2 cup chopped hazelnuts over the lady fingers. Set the pan aside for now. In a large bowl, combine Mascarpone cheese and cream cheese together. Beat on medium speed until well combined, scraping the bowl often. Add 1/4 cup sugar, egg whites, and vanilla extract, then beat again until you have a smooth topping. Pour Mascarpone mixture on top of the lady finger-hazelnut layer, smoothing evenly. Dollop the reserved brownie batter over the cheese layer, then use a butter knife to create a swirl pattern through the cheese and brownie mixtures. Sprinkle the top of the cheese-brownie layer with remaining 1/2 cup chopped hazelnuts. Bake for 45-50 minutes, until cheese layer has a slightly golden hue. Allow to cool completely, then cut brownies into 2″x2″ wedges. I received a Keurig as a Christmas present from my bosses just this past year and I absolutely love it!! I’m not a huge coffee drinker…just one cup a day (maybe 2! )…so it’s perfect for me. Plus, I love all the different flavors, the hot apple cider, the hot chocolate, etc. Now that it’s summer, I need to find some of the “brew over ice” k-cups so I can try those. Thank you so much for featuring the Keurig and look forward to your giveaways! I love Tiramisu and brownies both and this combo sounds perfect! It’s been a while since I’ve had tiramisu. I’m not surprised your husband loves this. It is very good–a special treat. I also like carrot cake. My family knows to get this for me for my birthday. 🙂 I remember as a youngster making tiramisu with my mother. It’s been a long time since I’ve made it. I’ve never had it in the form of a brownie. I’ll have to bookmark this recipe and make it for a special occasion. Wanted to try these, so I went to order some coffee and the coupon doesn’t work. Andrea, thank you for alerting me. I just tried it as well and got the same error. I’m so sorry! I’m reporting it to GMC right now, and we’ll get it fixed. I’ll comment again as soon as it is. Hi ladies – the issue with the coupon has been fixed! Enjoy, and happy shopping. Sounds really good. I LOVE Tiramisu!!!!! !